Well over half of all uncontested divorces in the U.S. are filed without an attorney. Also referred to as "pro se" or "in pro per," representing yourself is a do-able task when you have access to up-to-date, state-specific legal forms and reasonably detailed instructions. However, whether you hire an attorney or represent yourself, there are times when it will be necessary to amend, or fix, and then re-file, one or more documents in order to get your divorce finalized. Changes in address, employment, income, matters concerning the care and custody of children, and distribution of property and debts, are the most common reasons why you may need to file an amended document. Another common reason for an amendment is missing information. This usually happens in one of two ways. Either the filer failed to provide information requested on the form, or the judge requires certain additional information that wasn't included when the document was initially filed with the Court Clerk's office. Occasionally, a judge may even want something removed from a document. Usually, it will be the judge or the Court Clerk's office that advises you of the need to amend. Either you will be told of a problem at the time of filing or during your court hearing, if one is required in your state, or you will receive a written notice in the mail advising you that there is a problem with your documents. Some written notices are extremely detailed and make it clear what changes are needed. In those instances, the amendment is little more than a matter of editing your existing document and refiling it. Some rejection notices may include citations to statutes and/or court rules specific to your state or county. If this is the case, you can look up the code section and read it. Sometimes, the citation is to a very lengthy law or court rule, which makes it less helpful, but often, it takes you to a very specific section of law that you can then compare to the applicable sections of your documents in an effort to diagnose the problem. Note that amending applies only after you have filed a legal document and have determined that changes are needed. If you haven't yet filed the document, you simply need to make your changes before you file it to avoid problems. Download your document in an editable format like Microsoft Word. 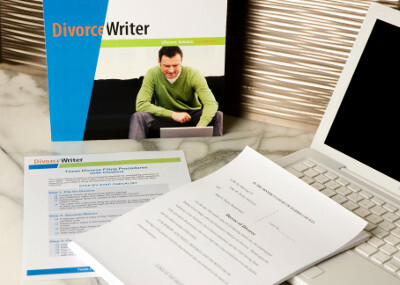 Most DivorceWriter packages are entirely in Microsoft Word format. If you used an online tool like DivorceWriter to create your own divorce forms and the issue causing the rejection is related to your response to one or more online interview questions, you may be able to log in to your account, make the desired changes/additions to your responses and then print revised forms. Then, you can proceed to Step 2. Type "Amended" at the beginning of the title of your document. Tip: If the document is a PDF, the title isn't usually a fillable field, so you'll have to hand-write "Amended" at the beginning of the title after you print it. Type in the case number. When you first received your documents, you didn't have the case number, also referred to as a cause number or file number, but now your divorce case has been assigned a number that must appear on the first page of every document you file. Make the changes to the applicable sections of the document. Review the filing instructions. You should review not only the filing instructions that you received with your document package, but also any instructions you may have received as part of your rejection notice. If they conflict, the information from the judge or Court Clerk is going to be most accurate for your county. Save and print. If the document is a PDF, you should be able to change the information in the fillable fields, but you should print before you close the document because sometimes PDFs can't be saved for you to access later. Printing before closing will keep you from having to revise the form again if you're unable to save it. Sign and date the amended document as needed. Determine if changes to this document affect other documents. Sometimes, making changes to one document will require you to make corresponding changes in one or more other documents to remedy any inconsistencies. This includes documents that have not yet been filed and also those that have already been filed. For documents that have already been filed, you will need to follow the same steps to amend, re-file and serve those as well. File the original amended document and photocopies. When you file the amended document, you'll need the same number of copies that you needed when you filed it the first time. Serve a copy of the amended document on your spouse. If you're amending an initiating pleading, namely the Complaint/Petition for Divorce, you must follow the same steps, if any, for service of that particular document on your spouse as you were required to do for the first version you filed. In most states, this means having your spouse sign another form to waive, accept or acknowledge service. However, if your state has more formal service requirements, those must be complied with again in order to properly serve the Complaint/Petition for Divorce. Refer to the written filing procedures you received with your document package for more information. For any other amended documents that aren't initiating pleadings, it should be sufficient to just mail a copy to your spouse. Certified mailing with a green return-receipt requested probably isn't necessary, but it does give you the peace of mind of having something to show the Court (the return-receipt signed by your spouse) should compliance with service requirements ever become an issue. Complete and file proof of service of the amended document. If you amended a Complaint/Petition for Divorce and you need your spouse to sign another document to waive, accept or acknowledge service, you will need to revise the acceptance of service form you used to reflect that it is amended and that your spouse is accepting service of an Amended Complaint/Petition. Do this before you give it to your spouse to sign. If the document being amended is not a Complaint/Petition for Divorce, it's generally sufficient to create and file a simple Certificate or Proof of Service. You may have already received some form of Certificate or Proof of Service with your document package, which you can copy and paste into a separate document. If not, DivorceWriter will e-mail supplemental forms to you, which should include a Certificate or Proof of Service. Sometimes, if a written rejection notice is sent, it will provide a date by which the amendment must be filed. It's very important to file all documents in a timely manner, ideally sooner than the deadline. In many courts, failure to file amended documents in the time allotted will result in the judge dismissing your case. If this happens, your case will effectively be over, and you may have to file for divorce and pay the filing fee again. If you didn't receive any deadline, you should immediately file an amendment or contact an attorney to avoid dismissal of your case and the forfeiture of your filing fee. Many family law attorneys even provide free consultations. Take everything you've filed with you to your consultation. Occasionally, the rejection information is so vague that it yields no useful clues as to what needs to happen next. In those instances, your only option is to review your documents thoroughly including the instructions you received. If no clear discrepancies stand out, you may need to contact an attorney to assist you further. Because DivorceWriter is not a law firm, the laws governing self-help legal products prohibit DivorceWriter from providing legal advice or assisting with amending legal documents. Only an attorney can legally review your paperwork and tell you what needs to be changed.